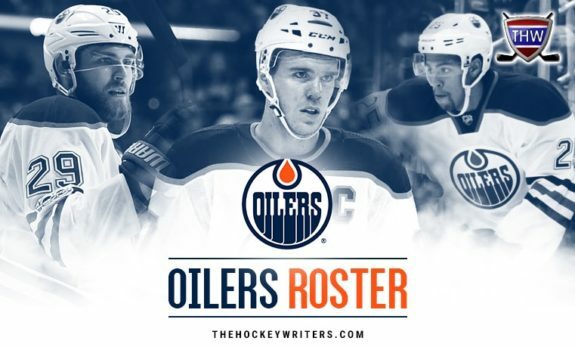 Earlier this summer we looked at the probabilities of what the Edmonton Oilers 2018-19 opening night roster would look like. With the preseason schedule winding down, several stories have changed what most thought was a foregone conclusion. It’s like they say, you never know until the games are played. Edmonton currently holds a training camp roster of 29 players after a series of re-assignments to junior clubs and their AHL affiliate, the Bakersfield Condors. They brought three players into camp on professional tryouts (PTO’s) in Alex Chiasson, Jason Garrison, and Scottie Upshall. Chiasson and Garrison are still competing for a spot while Upshall was released from his PTO over the weekend. To take a look back, here’s the roster that was included in the Oilers season preview piece posted at the beginning of the month. It’s a roster of two goaltenders, seven defenders, and 14 forwards. * Denotes players expected to start the year in the AHL. A huge question mark for this club was the right wing depth, and so far in the preseason, the club is getting consistent secondary scoring in spots No. 1-3. 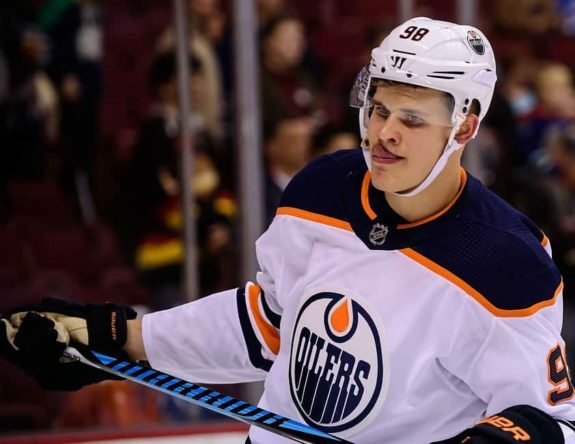 Ty Rattie currently leads the NHL in scoring during the preseason, Jesse Puljujarvi has been hot, and Kailer Yamamoto is proving doubters wrong. Tobias Rieder is still trying to find his legs, while Zack Kassian has cemented himself as the fourth-line right wing option. On defense, Evan Bouchard is proving to be more NHL-ready than some expected and looks like a near lock to start the year with the Oilers. Jakub Jerabek, however, hasn’t looked great at all. It’s given the club a possible scenario of Ethan Bear even starting the year with the club. Would Edmonton yield a roster that includes eight defenders with Bear, Bouchard, and Jerabek rotating in and out as the No. 6? We’ll see. Two players that haven’t looked good upfront are Pontus Aberg and Drake Caggiula. They’ve been more or less invisible at times, and are now on the outside looking in. 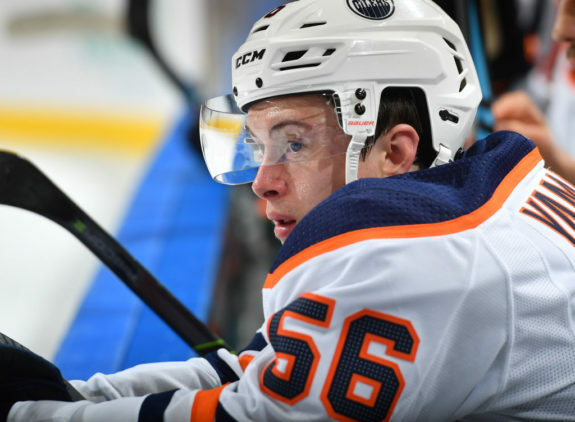 Going back to Rattie, he has a surprising seven goals in preseason play and has been a stud playing alongside Ryan Nugent-Hopkins and Connor McDavid on Edmonton’s top line. His play has silenced most doubters, for now. Related: Ty Rattie – Perfect Fit for Oilers? Credit where credit is due, as he looks like he could be one of the best value contracts in the NHL this season at $800,000. Can he score 20 goals this year? Entirely possible regardless of what the odds-makers might say. Another player that’s turning heads is Yamamoto who made the club out of camp a year ago and now looks to do it again. This time, Yamamoto hopes he can stick for the season. So what does it all mean regarding changes to my opening night roster predictions? There are two models in constructing this club, and the question now is what do Oilers general manager Peter Chiarelli and head coach Todd McLellan feels works best for them? Is it going 2-7-14 or 2-8-13? In this roster prediction, the one that makes the most sense that also doesn’t force the team to lose any assets to waivers is a 2-7-14 model. There are a few changes, call them tweakings, in comparison to the predictions made a month ago. What does change is the players and who’s in what spot. Cam Talbot has had a strong preseason and is rounding into form, while his backup Mikko Koskinen has proven to be a suboptimal solution as the No. 2. 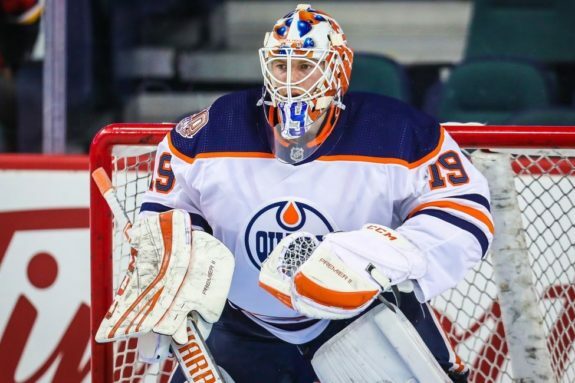 Koskinen’s big-ticket contract has left much to be desired, but from all likelihood, he still has the job as Talbot’s backup. That means Al Montoya should be waived at some point during the next week. With the club going to Europe at the end of the week, it’s probable that Montoya accompanies the team on that trip to Germany, and then is re-assigned afterward. Oscar Klefbom and Adam Larsson are healthy, and Darnell Nurse and Matt Benning have seemingly improved their overall puck-moving abilities. Kris Russell has nuzzled himself in nicely as Edmonton’s reliable No. 5, while the No. 6 spot is still up for grabs. It’s Bouchard’s job to lose, while Bear, Garrison, and Jerabek battle from behind. Ironically enough Garrison and Jerabek were paired together in the Sept. 25 game against the Canucks. If we were to rank those players based off play it’s; Bouchard, Bear, Jerabek, Garrison. If rated on fits for the organization, it’s Bouchard, Jerabek, Bear, Garrison. It makes very little sense for the Oilers to have the 21-year-old Bear start the year rotating in as the No. 6-7. What’s worse is him sitting in the press box as the No. 7 when he can be playing as a No. 1 for the Condors in the AHL. Garrison, 33, has struggled in his overall mobility and has stood out like a sore thumb over the final half of the preseason. Jerabek, 27, hasn’t been much better, but the investment is there for him as an insurance policy in case Bouchard doesn’t work out this year. Expect a decision on Garrison to be announced in the coming days. The real question for Garrison now becomes where he wants to go from here? It’s no secret he’d be a welcomed addition to Bakersfield in a player-coach role to mentor the young blue line that’s coming together. Bear, Caleb Jones, William Lagesson and others would greatly benefit from some guidance from the veteran with 538 NHL games under his belt. Then again, he’s already made over $30.7 million in his ten year NHL career and might not want to ride the bus in the AHL. We’ll see what happens. Not much has changed in the predictions between the pipes and on the blue line. In a Twitter poll ran over the weekend, 48% of the voters wanted to see Bouchard paired up with Nurse, while 40% went with Russell, 11% with Klefbom, and 1% of the voters going with another choice (Matt Benning). It looks like Bouchard will be starting off with Russell. It gives him a defensive defender that should allow him to take some risks offensively and join the rush. Upfront, nothing has changed with Nugent-Hopkins, McDavid, and Rattie sticking together as the top forward line. As predicted, Milan Lucic has been more or less glued to Leon Draisaitl’s left wing. Tobias Rieder looked like a lock to start the year as the No. 2 right wing, but a quiet camp and the hot starts by Puljujarvi and Yamamoto have bumped him out of that role. You can now slide Rieder over to the left side. As mentioned, Aberg and Caggiula have been invisible, and that’s allowed Jujhar Khaira to firmly entrench himself as the No. 3 left wing option, and one that might be able to shift to center if need be. Both Aberg and Caggiula are in danger to possibly even get waived and sent to the minors, especially if management feels Chiasson gives them a better option in the bottom six. 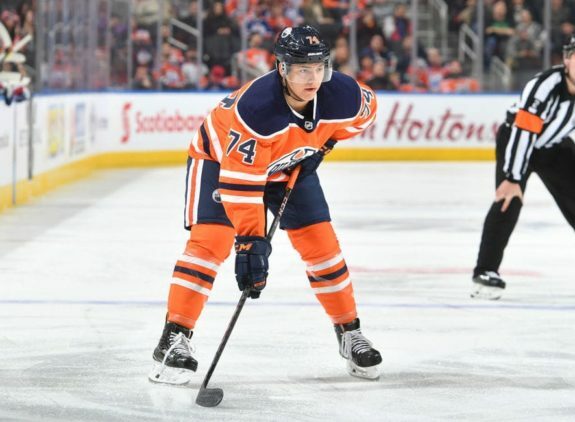 Back to Puljujarvi and Yamamoto, it would be nice to envision Edmonton’s 2016 first-rounder getting a look next to their 2014 first-rounder in Draisaitl. Of the top three options on the right side, Puljujarvi has been very consistent. There was little to no chemistry in the Canucks game between Draisiatl and Yamamoto, so watch for McLellan to try Draisaitl and Puljujarvi possibly. In the end, this is the roster we could be looking at if the club doesn’t sign Chiasson to a contract. Whether it’s better than the team iced in 2017-18 remains to be seen, but in the short amount of time we’ve seen them together in 2018-19, this club has some more jump, seems embarrassed by last year’s finish, and looks hungry to get back into the playoffs. Do you agree with this roster prediction? Let us know your thoughts in the comment section below.